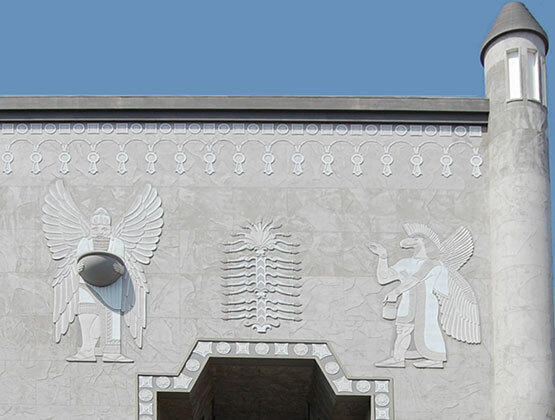 I drove by the Assyrian carvings on the towers of Hollywood & Highland today, Louisiana rap music blasting from my speakers, and I felt a feeling that I’ve felt many times before, but one whose manifold nuances and raw emotional impact I’ve never been able to convey clearly to anyone — not other rap aficionados; not best friends; not even girlfriends or family members — because the progression from ancient Mesopotamia to modern gang culture isn’t exactly an obvious, linear one. But to me, the emotional and instinctual substrates of the ancient Near East and modern ghetto culture are so tightly bound up with one another as to be mutually inextricable. Let me try to explain why. First of all — I mean, just look at the pictures here while you listen to this music. It should become pretty obvious on a gut level. As a friend of mine once said, in the ghetto it’s not enough to be yourself. If you want to survive in the hood, you have to become a god. You need not only the right weapons, but also the right accompanying myths and cultural elements; the right rituals, secret signs and code words; in order to dominate your enemies and secure the loyalty of a band of thugs. That’s as true now as it was at the dawn of human civilization. It was true in what’s now Iraq, a thousand years before the Greeks were building mud huts: The Assyrians, a trading people crushed under one wave of imperial rule after another, got hold of a newly discovered metal called iron and somehow figured out how to turn it into the cheapest and most durable swords, spearheads and arrowheads anyone had ever seen. They swept the Iron Age westward across Mesopotamia on the edges of a hundred thousand blades. They were Nazis in some ways — and gang lords in others. Only the richest and most brutal Assyrian warlords survived to leave inscriptions and bas-reliefs attesting to their wealth and virility — and deifying them in the pantheons of their countries. In these inscriptions, rulers brag about the vastness of their palaces; the adornment of their chariots; the ruthlessness of their soldiers; the luxuriance of the fabric they wear; the humiliation and mass slaughter of their enemies. But the aesthetic texture that unites these two cultural periods runs far deeper. The brags of Assyrian warlords and South-Central gangstas are codified, in scenes of ritual poses and gestures — hand signs like the mudras of Buddhism, which originated in ancient Egyptian mysticism. To the outsider, these are just stilted gestures — but to those on the inside, they are packed with subtle meaning. A strikingly similar effect becomes noticeable in photos of gang members in post-60s L.A., when the generation of kids that watched blocks burn in Watts passed adolescence, found themselves without their own Martin, Huey or Malcolm to rally around, and began to lay down the laws of their own universe from scratch: “Where are you from? Where do you stay? What do you claim?” Pressed jeans and Dickies and Ben Davis; clean jackets and crisp new white tees. Again, ritual hand signs and casually stilted poses. In other words, the Supermen must have their own uniforms; their own salutes and silent signs and rituals and epics. As in Egyptian tombs, this priestly formalism codifies each warlord in the mythological and aesthetic “language” that is assumed to underlie and support the very fabric of the universe itself. But these people are not Egyptian priests or Buddhist monks — they are thugs-turned-gods. Violence is their sacrament — and their warfare is quite literally a holy ritual. These kinds of brags are so overwhelmingly common and so codified in format — across thousands of years of cultural history — that the repetitiveness and near-identicality of the violence and riches they describe have become long-running jokes among archaeologists. Interestingly, the same criticisms are frequently leveled against gangsta rap music, for almost exactly the same reasons. Like modern gangs, many of the world’s earliest empires were völkisch empires: Empires specifically for your tribe; on your soil; filled with your people — your extended family; your church’s members; your friends and lovers; your deadliest enemies. Many gang members in South-Central L.A. have never traveled west of the 405 or east of the 605 in their entire lives. Like those ancient Mesopotamian warlords, modern gangs fight not only for their physical territories, but for the whole “cauldron of beliefs, fears and hopes” that gives völkisch thinking a more mythic flavor than mere blood ties or turf wars. Because gang warfare isn’t just about the turf, nor is it solely about blood and family — it is fundamentally religious warfare, in the same sense that Assyrian summer campaigns were religious warfare nearly three thousand years ago: It is nothing less than the campaign of the new gods to subjugate the nonbelievers. Note that the inferiority these leaders confer on their enemies isn’t necessarily racial or geographical or even necessarily technological. It is a supposed inferiority in myth-making; in god-training; in cultural and technological relevance — for lack of a more comprehensive word, in coolness — at least in the eyes of those who make war on it.